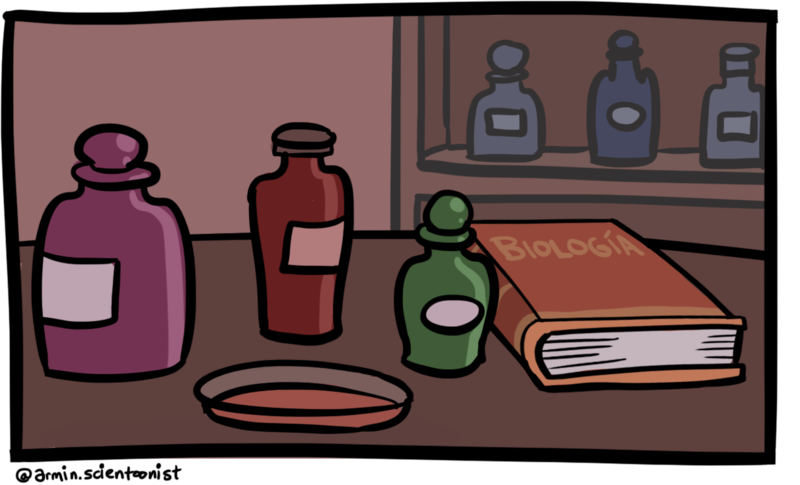 Click through our cartoon timeline on the history of neuroscience below, and use the menu above to find out more about our project and team! Alan Hodgkin and Andrew Huxley began their collaboration at a young age when Huxley had just finished his first year of university. Hodgkin invited him to join forces at the Plymouth Marine Biological Association. Hodgkin had spent the previous summer acquiring dissection skillsand had been introduced to the squid giant axonthrough the work of John Zachary (JZ) Young. Together Hodgkin and Huxleyrecorded the first action potentialfrom a giant squidby inserting a micropipette into the squid giant axon(one of the earliest known applications of the voltage clamp technique). 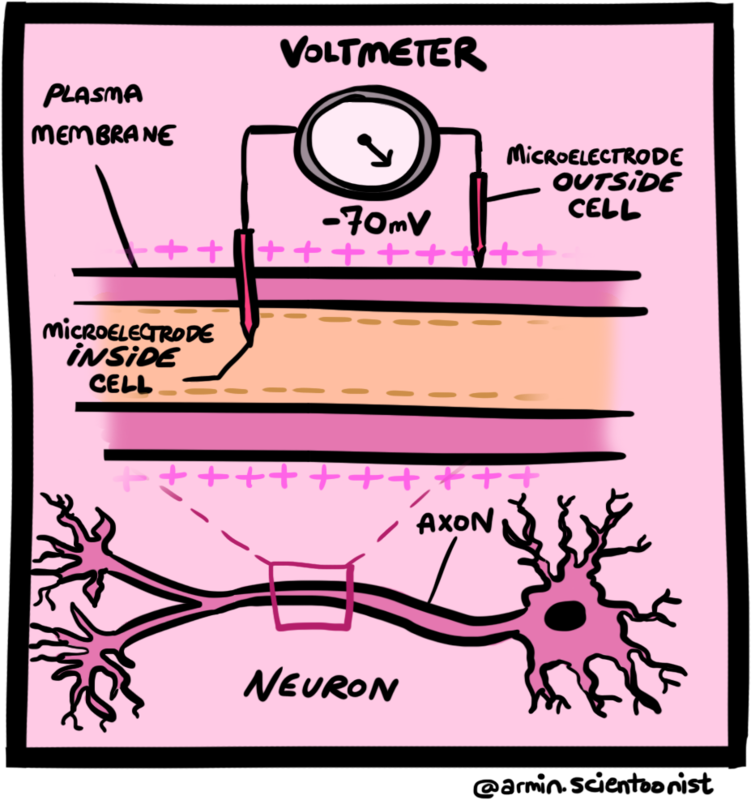 Hodgkin and Huxleywere able to show that the inside of a neuron is more negatively charged than its surroundings, but when it fires an action potential, the voltage in the neuron shifts to be more positive than the external environment. 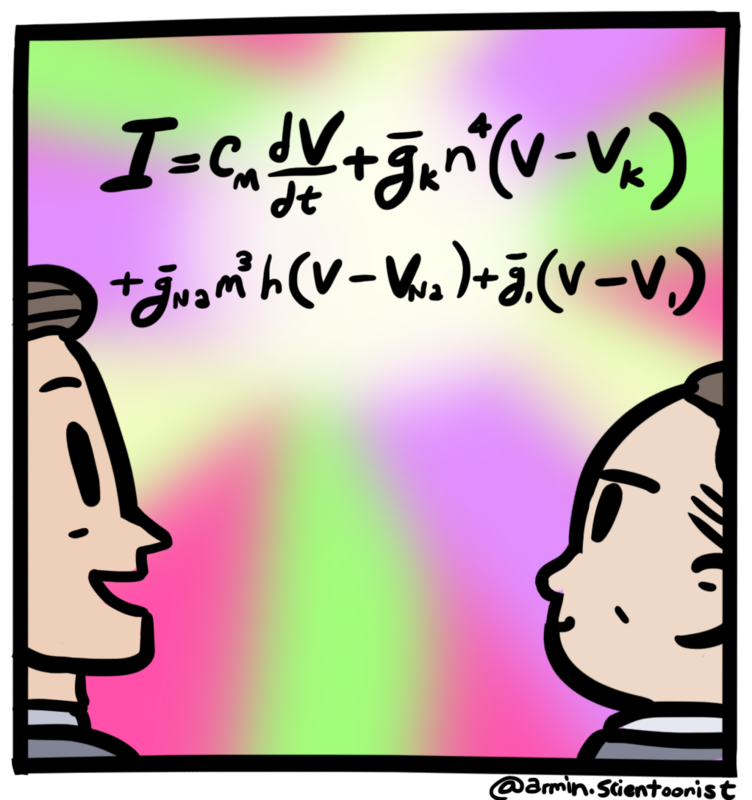 The duo is most famous for the Hodgkin-Huxley equation which treats each component of a neuron as an electrical element, and can accurately measure the current flowing through the membrane bilayer during an action potential. Hodgkin, Huxley, and John Eccles(accomplished influential work on peripheral nerve synapses)shared the 1963 Nobel Prize in Physiology or Medicine. An action potential is a neuron’s way of transmitting a signal to a neighboring neuron, allowing for communication between different parts of the brain. It requires both electrical and chemical changes for transmission to occur. In 1831, the naturalist Charles Darwin embarked on a voyage to the Galapagos Islands, amid many discoveries he is famously know for describing the variety of beak shapes in finches and how these beaks are adapted to different lifestyles. This research led to his development of the theory of natural selection, which describes how populations of organisms, including humans, have adapted to their environments over time. In other words, the phenotypes or characteristics that provide a reproductive advantage are selected for over time. Darwin’s theory is the key mechanism of evolution and the basis for decades of research on genetics, natural selection, and artificial selection. 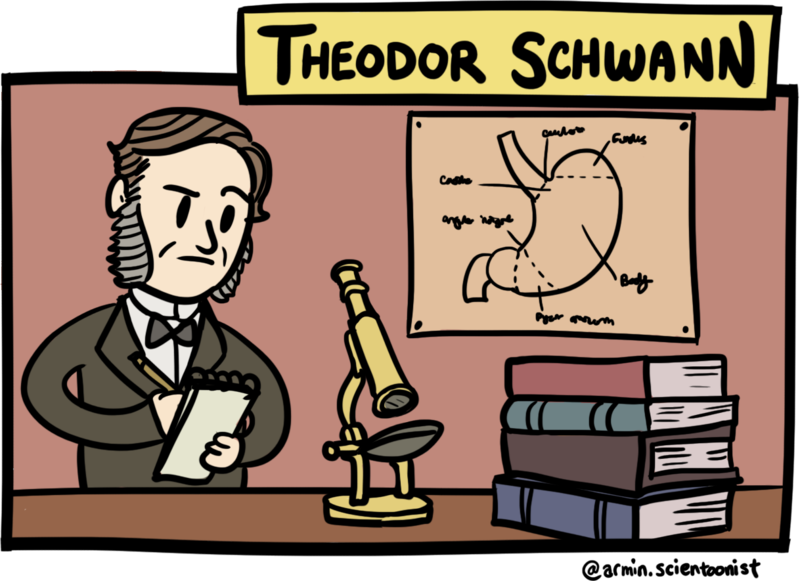 Theodor Schwann was born in Germany and had his first scientific success at the University of Berlin; he discovered pepsin, an enzyme that helps to break down proteins during digestion. 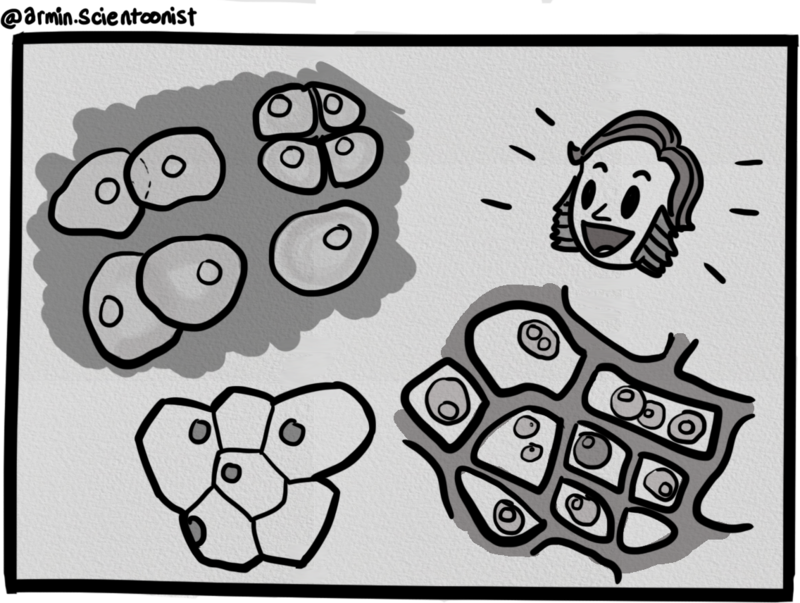 He contributed to the cell theory by expanding on Schleiden’s findings in plant tissue, and concluded that all living organisms are composed of cells. Schwann was an award winner, a scientist and a teacher, but despite all his accomplishments, he was never married. His most notable accomplishment was the discovery of myelinating glial cells that wrap around peripheral nerves, allowing for faster signal transduction between parts of the body. 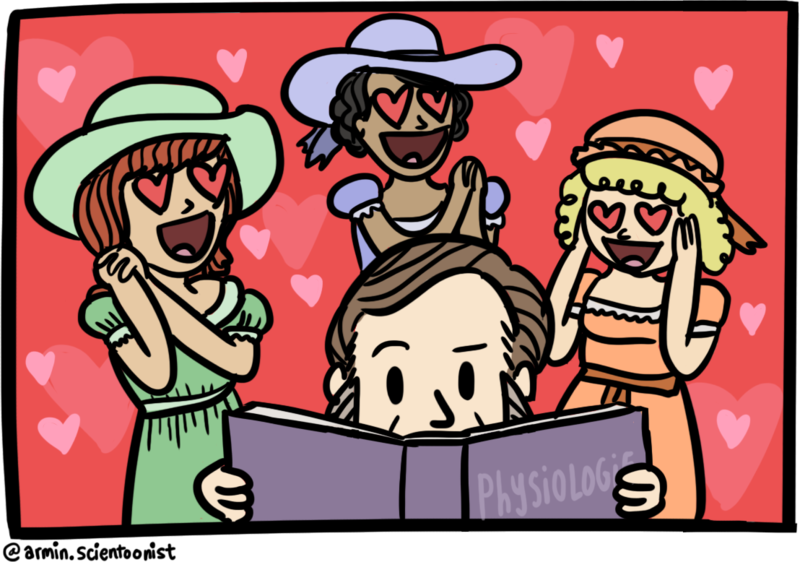 These cells were named Schwann cells after his discovery. 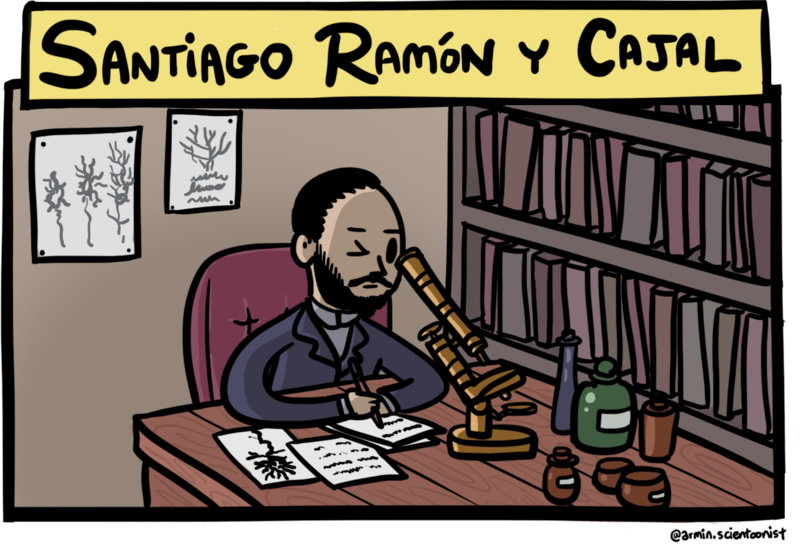 Santiago Ramon y Cajal, considered by many to be the father of modern neuroscience, was one of the first to investigate the microscopic structure of the brain. However, Cajal was not always interested in the brain. As a child, he wanted to be a painter, an artist, or a gymnast! 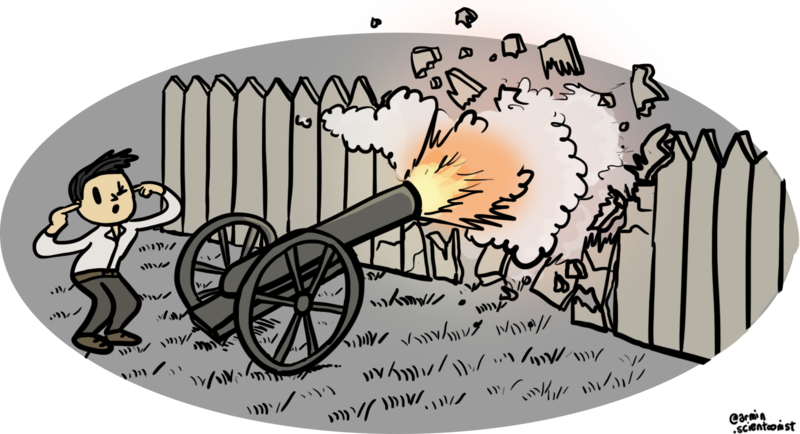 Cajal also had a well-known rebellious streak, and it is said that at age 11 he destroyed his neighbours’ gate with a homemade cannon! His father (a medical doctor) discouraged these activities, and wanted more for his son. 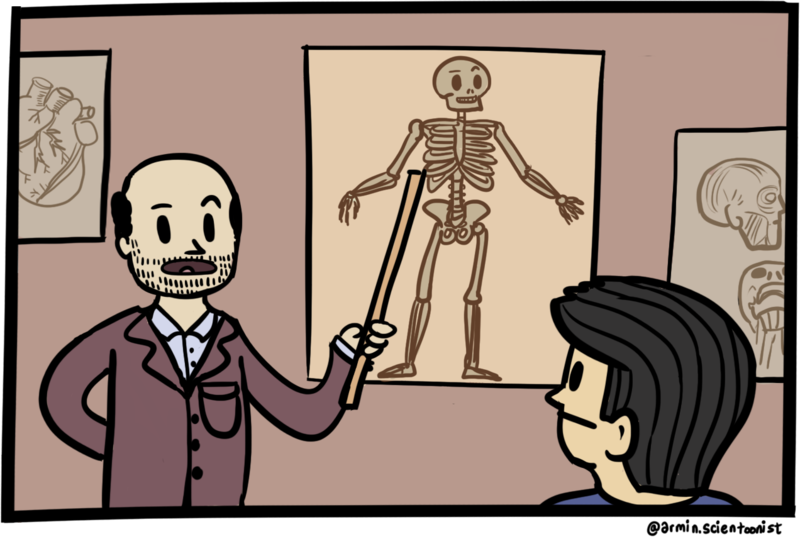 He directed him towards studies of anatomy. Cajal graduated from medical school at age 21, and got his doctorate at age 25. Cajal eventually learned of Golgi’s method, using silver nitrate to randomly stain a few neurons, which would allow Cajal to examine the central nervous system. Using his creativity and passion for art, Cajal made extensive drawings of neurons and imperative contributions to neuroanatomy. He discovered the growth cone, and demonstrated that nerve cells were not attached but merely in close proximity (known today as a synapse). All of this work culminated in Cajal and Golgi receiving the Nobel Prize in 1906. Alois Alzheimer was born in Markbreit, Germany, in 1864. He studied medicine at multiple universities, ultimately graduating from the University of Würzburg in 1887. He was an active member of his school’s fencing fraternity. After completing his education, Alzheimer moved to Frankfurt. 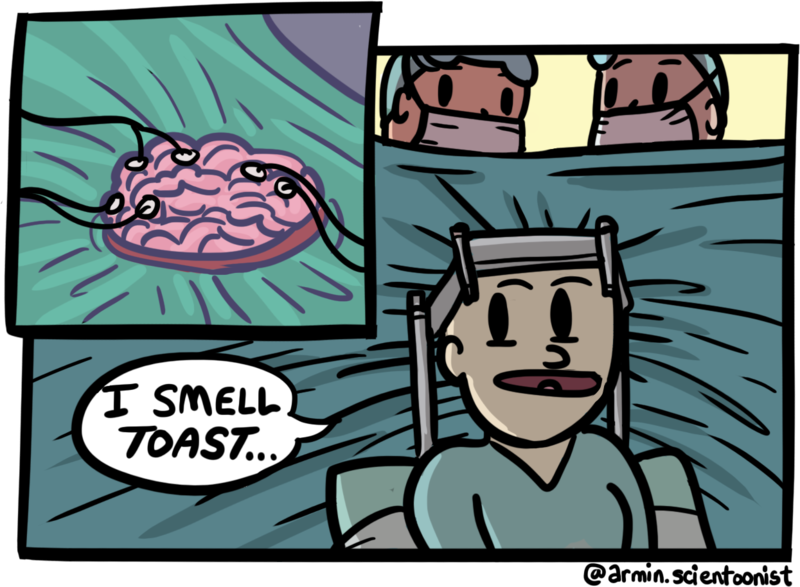 There, he met Frank (Franz) Nissl, who had developed a new method for staining brain cells. They became great friends and collaborators. In 1901, Alzheimer met a 51 year-old patient named Auguste Deter. She displayed severe symptoms of cognitive decline and Alzheimer took a keen interest in her case. After Deter’s death in 1906, Alzheimer examined her brain in great detail and discovered both amyloid plaques and neurofibillary tangles. These features have become the hallmarks of what is now known as Alzheimer’s disease – a neurodegenerative condition that impacts millions of people worldwide. Born in 1882 in Portillo, Spain, Pio del Rio Hortega became licensed in medicine, before moving into neuroscience research with Nicolás Achúcarro and Santiago Ramón y Cajal. 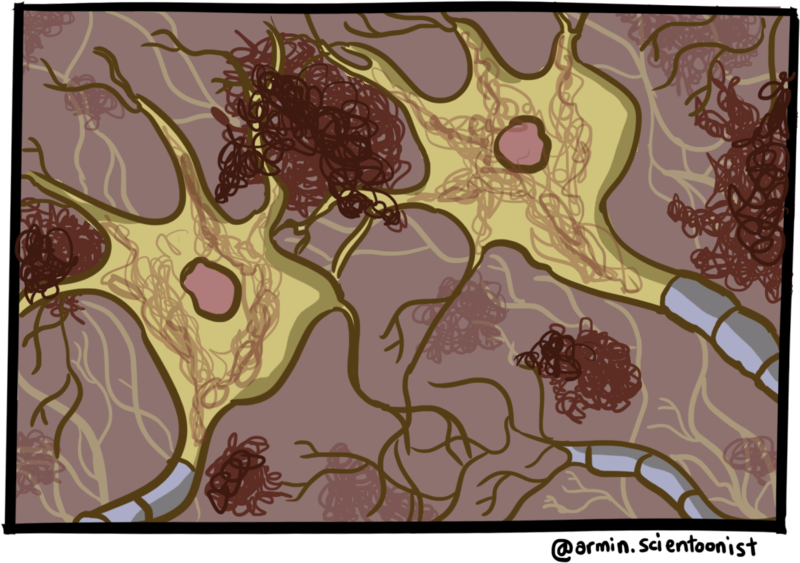 Hortega improved upon silver staining methods, allowing him to identify microglia (which are now recognized as the immune cells of the brain) as separate cells within the central nervous system. Interestingly, this caused disagreements with Cajal, who only accepted microglia much later. Hortega also later classified oligodendrocytes, which support and insulate central nervous system neurons through forming myelin sheath. Despite disruptions from the Spanish civil war, Hortega managed to continue research, and is recognized for his work on cerebral tumors and is still hailed the “Father of Microglia”. Born in Washington in 1891, Wilder Penfield studied literature at Princeton and was voted best all-around man. After serving in the military, he graduated from medical school in 1918. He became a Canadian citizen, and founded the Montreal Neurological Institute and Hospital in 1934, serving as its first director until 1960. Here, he developed the Montreal Procedure, where he identified and removed brain tissue causing seizures. During these surgeries, he mapped regions of the brain responsible for sensation and movement of the body. 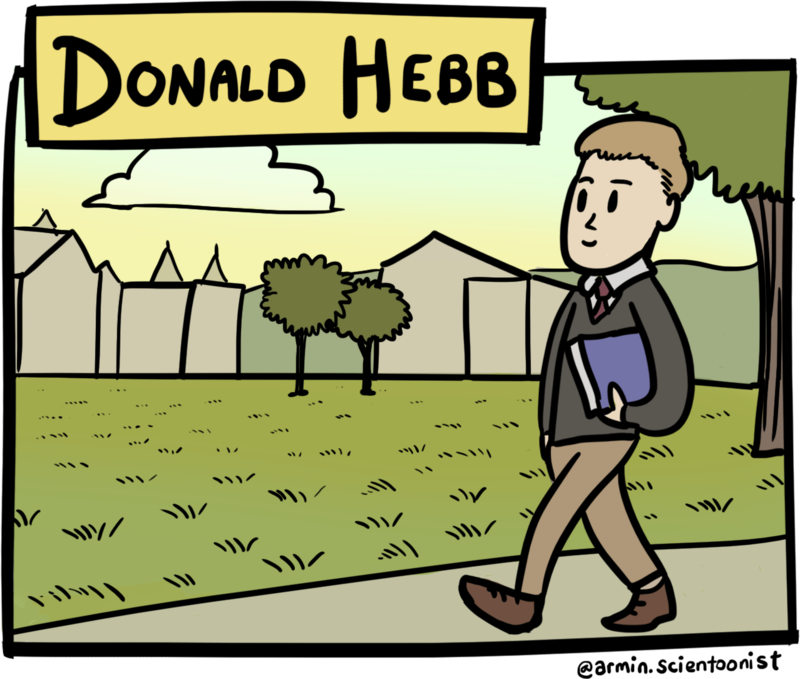 Born in Nova Scotia in 1904, Donald Hebb originally pursued a career in writing and teaching before becoming a graduate student in psychology at McGill University. During his studies, Hebb became increasingly frustrated with the lack of objectivity in psychological research. He began to pursue work with famous scientists such as Karl Lashley (a behaviourist) and Wilder Penfield (a pioneering neurosurgeon) in order to study the specific effects of a wide variety of brain lesions on cognitive functioning and human behaviour. In 1937, Hebb created the Picture Anomaly Test in collaboration with N.W. Morton. Hebb aimed to find specific aspects of intelligence that were altered following a brain lesion. 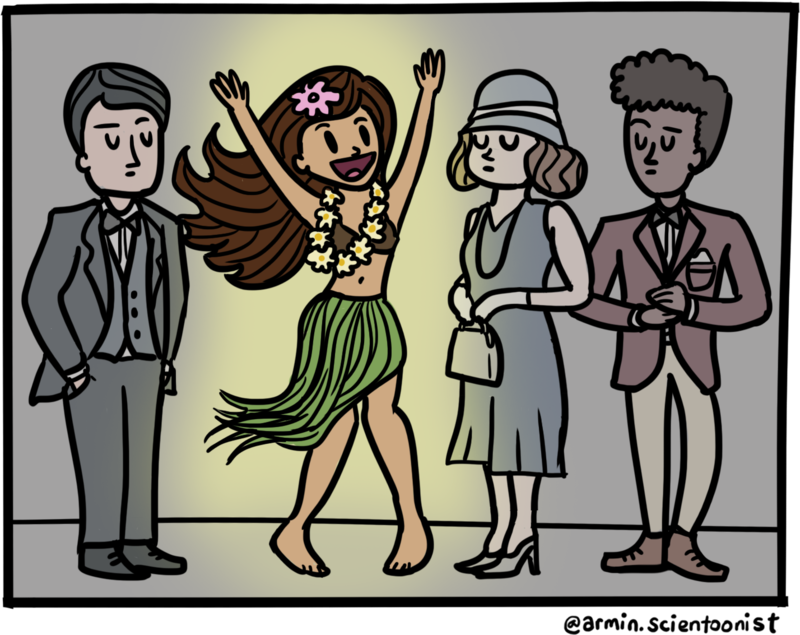 This test of visual intelligence involves a series of typical pictures that each have something obviously out of place. Lesions to the right temporal lobe impact the ability to point out the obvious absurdity in the photo. Hebb’s ultimate goal was to explain human behaviour using evidence from the fields of neuroscience, anatomy, and physiology. To unite these worlds, Hebb wrote a book explaining his theory of how learning occurs in the brain entitled Organization of Behavior. This theory, which is now known as Hebbian theory, postulates that neural pathways that are used more frequently are strengthened such that the connections become stronger and faster as learning takes place. 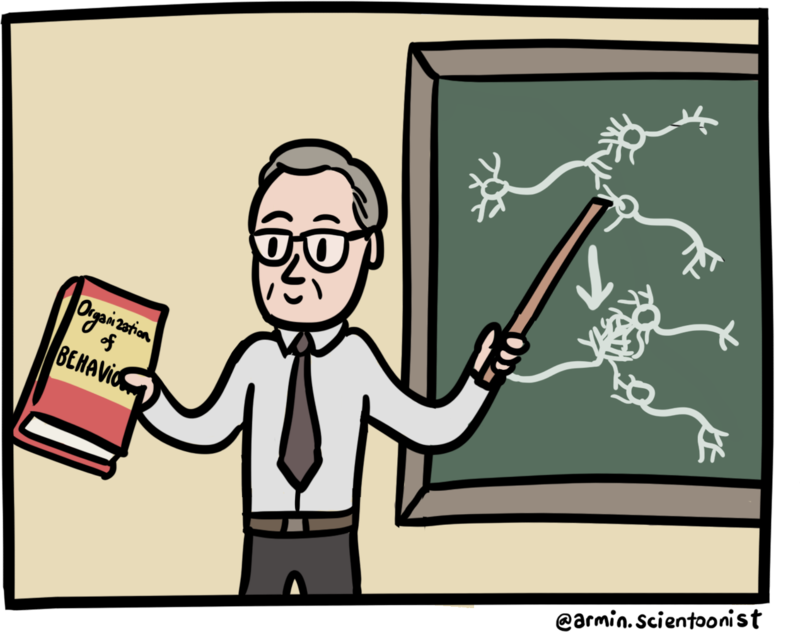 Hebb’s theory led to the very well-known saying: “neurons that fire together wire together”. The 1906 Nobel Prize in Physiology/Medicine was a tense and sensational ceremony (well, as sensational as science awards ceremony can be). At the time, scientists were trying to understand how neurons communicated with each other. 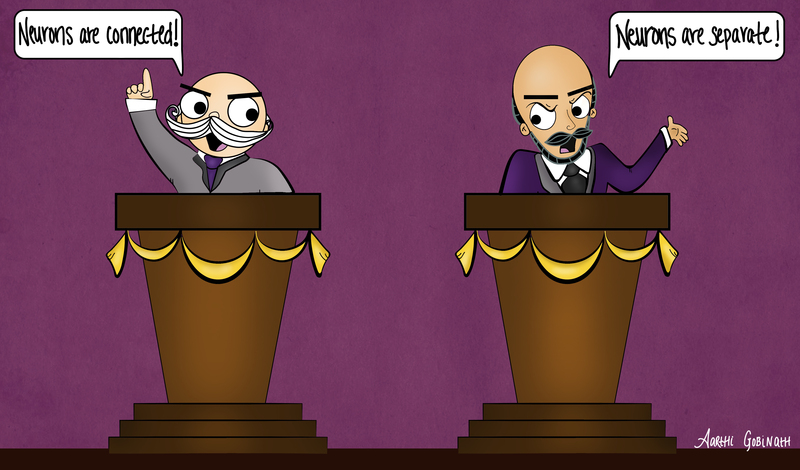 Camillo Golgi and Santiago Ramón y Cajal argued because their research led to opposing theories, which culminated in the two rivals bitterly sharing the Nobel prize. 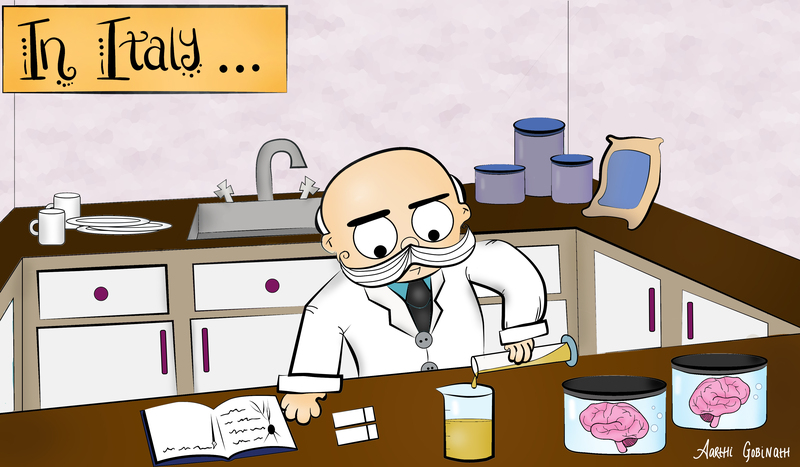 In Italy, Camillo Golgi developed a stain for visualizing brain cells. He developed this technique (or, “the black reaction”) in the kitchen of the hospital where he also worked as a physician. Named after him, the Golgi technique is still used today to visualize neurons. Based on his observations, Golgi argued for reticular theory, or the theory that all neurons were physically connected. This would mean that neurons communicated via signals travelling across a nerve net throughout the body. 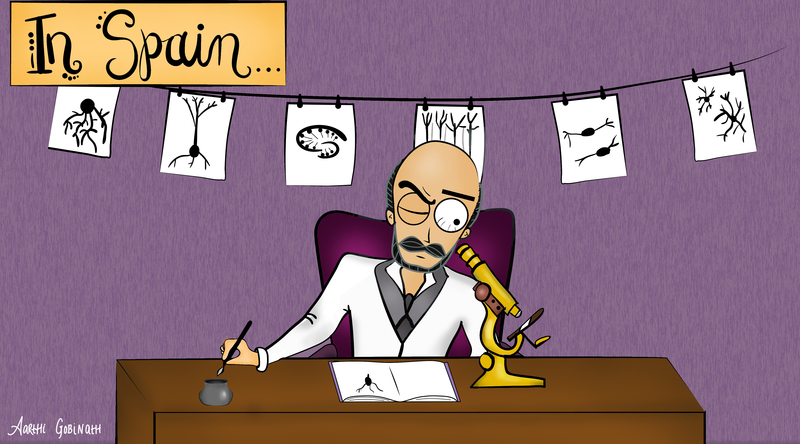 Meanwhile, in Spain, Santiago Ramón y Cajal had modified Golgi’s technique and was using it to study neurons too. He created thousands of detailed scientific illustrations of the nervous system. 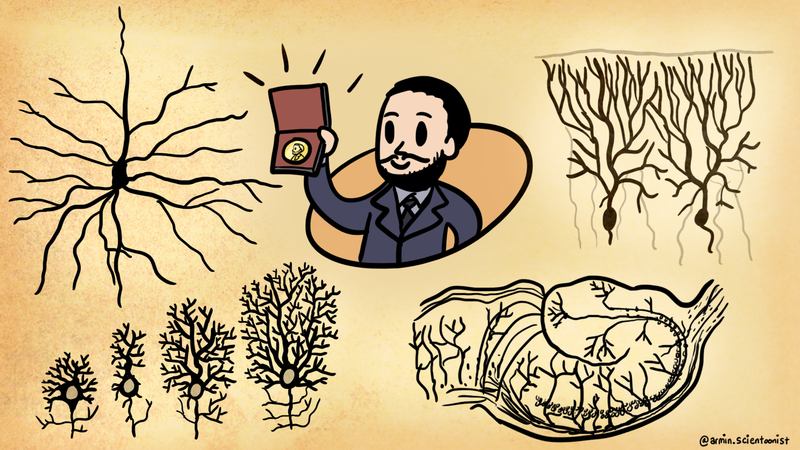 Based on his diligent and detailed observations, Cajal argued for neuron theory (and ultimately neuron doctrine), or the theory that each neuron was its own separate and distinct cell. 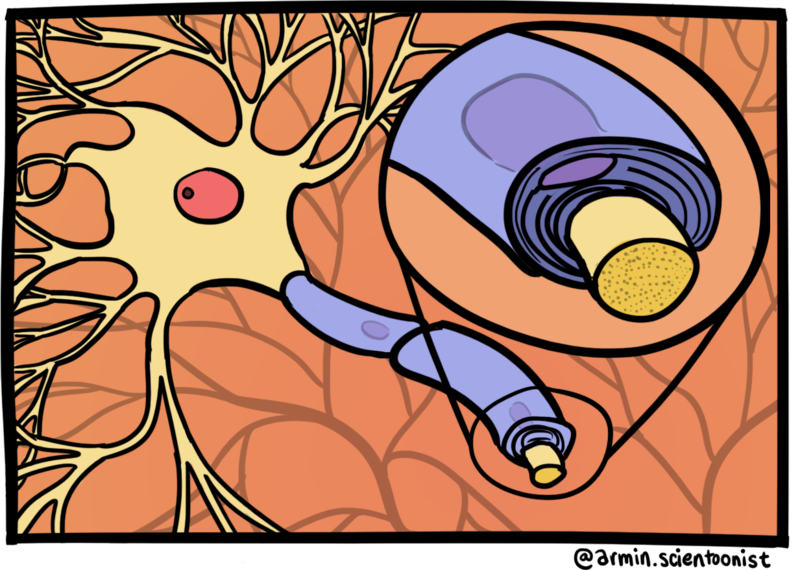 This would mean neurons communicated via a signal that traveled in the gaps between neurons. 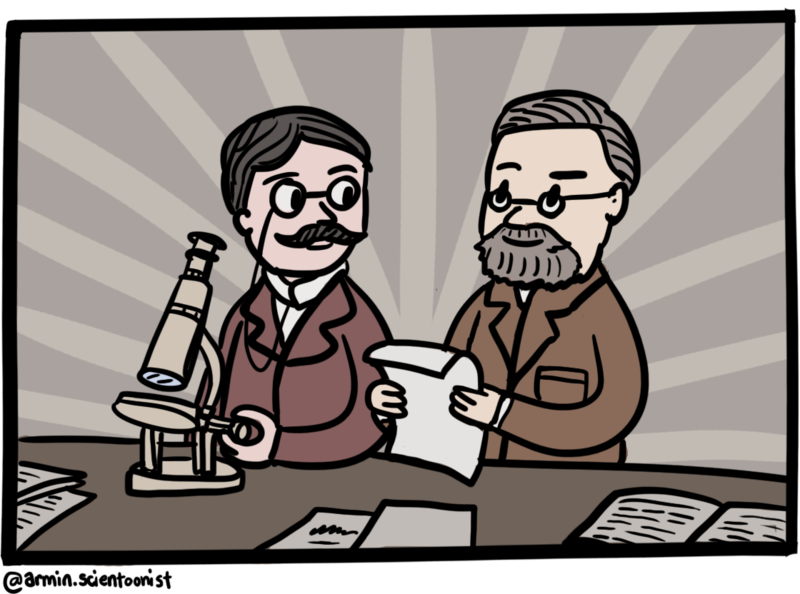 At the 1906 Nobel Prize ceremony, both Golgi and Cajal delivered their lectures and strongly argued against each other. At the time, it was a sensational and stormy event. 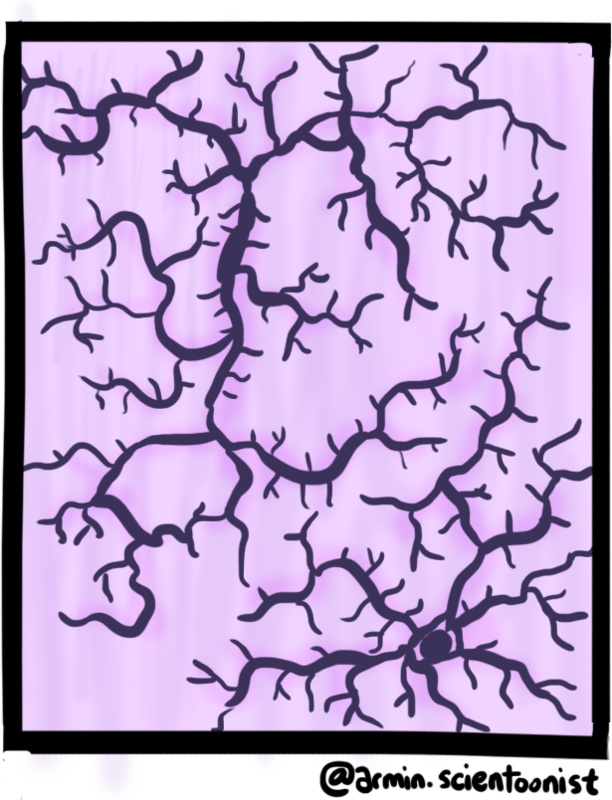 In the 1950s, advancements in microscopy confirmed that Cajal was correct and that there were gaps (or “synapses”) in which chemical signals could transfer between neurons. 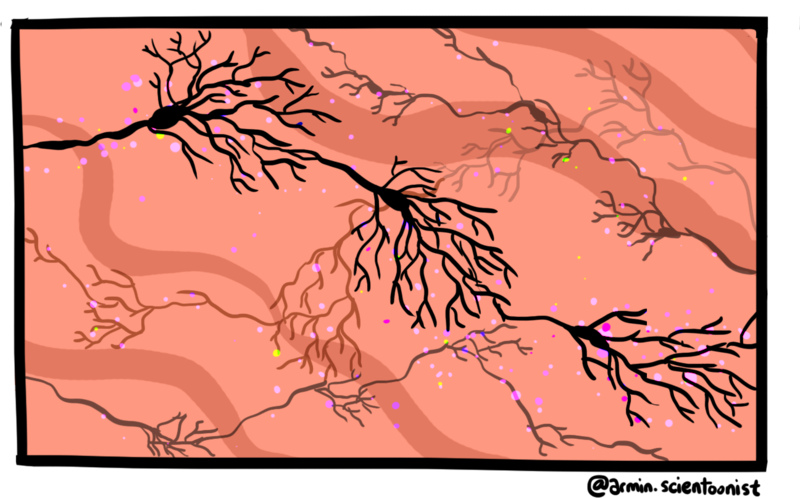 The neuron doctrine states that all neurons are discrete and separate cells and is a cornerstone of neuroscience research. 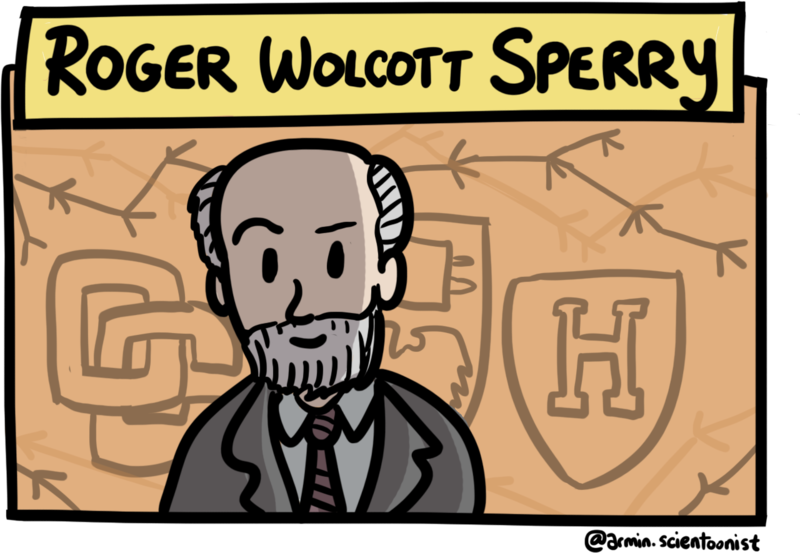 Born in 1913, Roger Wolcott Sperry grew up in Connecticut and went on to study at Oberlin College, the University of Chicago, and Harvard University. He advanced the chemoaffinity hypothesis, which states that neurons navigate to their targets using chemical cues. 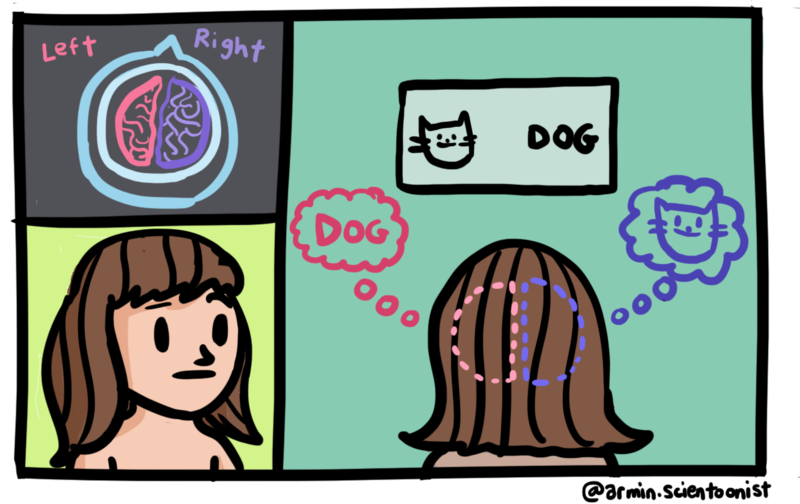 Additionally, using careful surgical manipulations, Sperry showed that if sensory and motor nerves are rearranged, animals suffered dysfunctions that could not be fixed with learning. For example, removing and rotating the eye of a frog 180 degrees during development resulted in inverted vision. 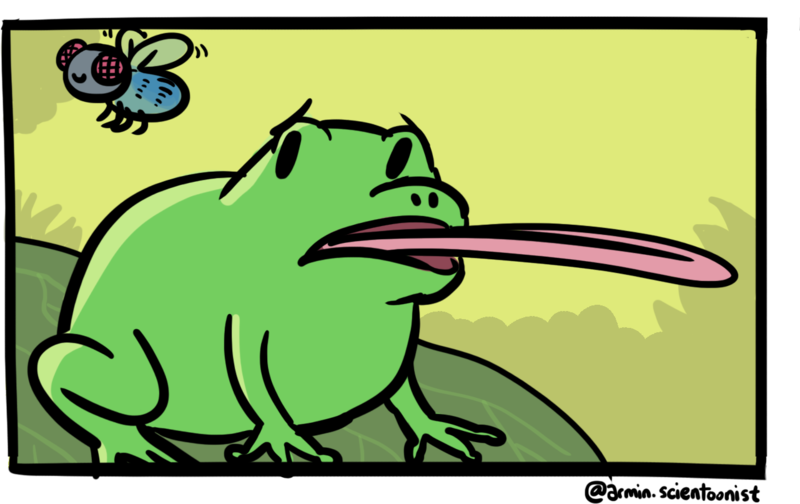 When a food source was presented above, the frog extended its tongue downward. This experiment helped Sperry determine that the optic nerve used chemical cues to navigate and connect to the visual system during development; even with rotation of the eye the original visual orientation remained, which caused inverted vision. Finally, in 1981, Sperry won the Nobel Prize for showing that when a connective structure called the corpus callosum is cut, the left and right hemispheres of the brain function separately. 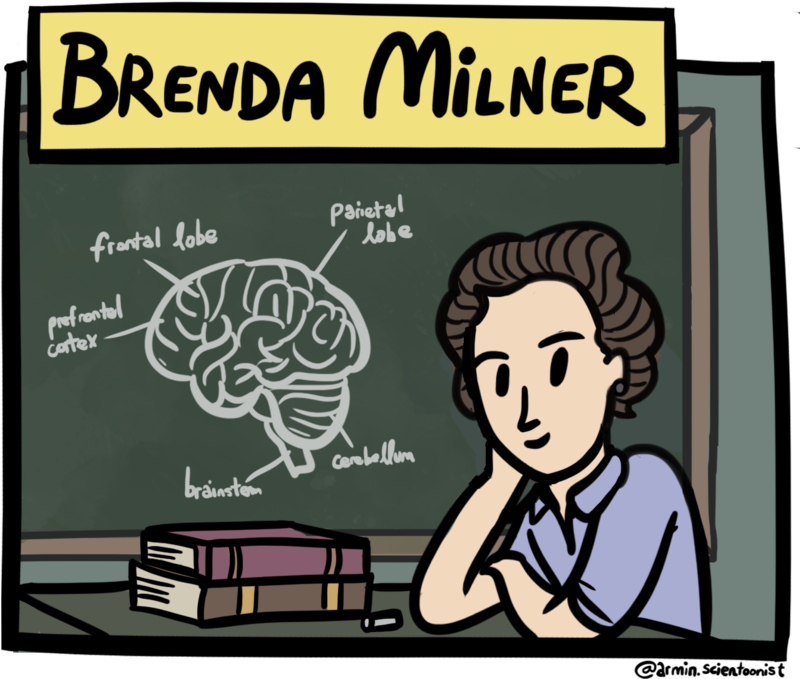 Brenda Milner was born in Manchester, England in 1918. She first became interested in researching the brain and behavior while studying psychology at Cambridge University. Upon moving to Montreal in 1944, the work of distinguished neuropsychologist Donald Hebb greatly inspired her, and she applied to do a PhD under his supervision. In 1955, Milner was introduced to patient H.M. 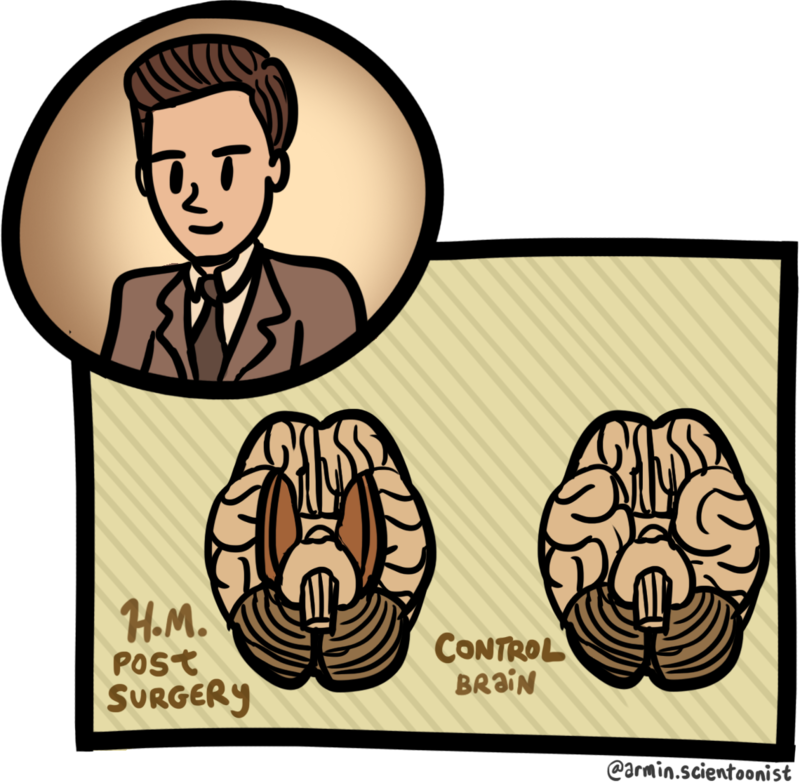 In an attempt to treat severe seizures, patient H.M. had undergone surgery that removed the focal point of the seizures - his medial temporal lobe. While successful in eliminating the seizures, the surgical treatment left patient H.M. with anterograde amnesia, which is the inability to form new memories. 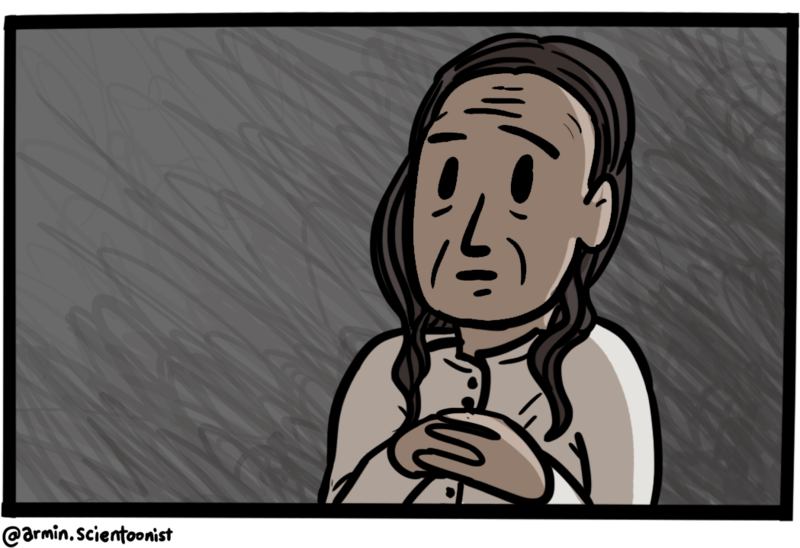 Milner spent many years undertaking extensive work on patient H.M., and discovered that he could acquire some types of memory. 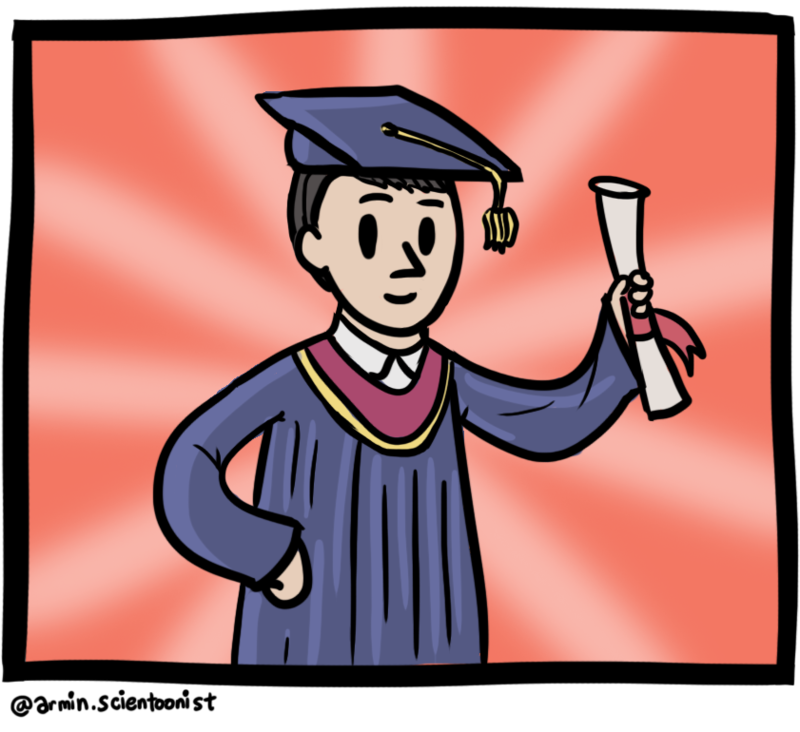 In particular, Milner uncovered a new procedural memory system – H.M. could learn new motor skills, even if he could not remember learning them. This work facilitated a huge growth of interest in the study of memory in the following decades. 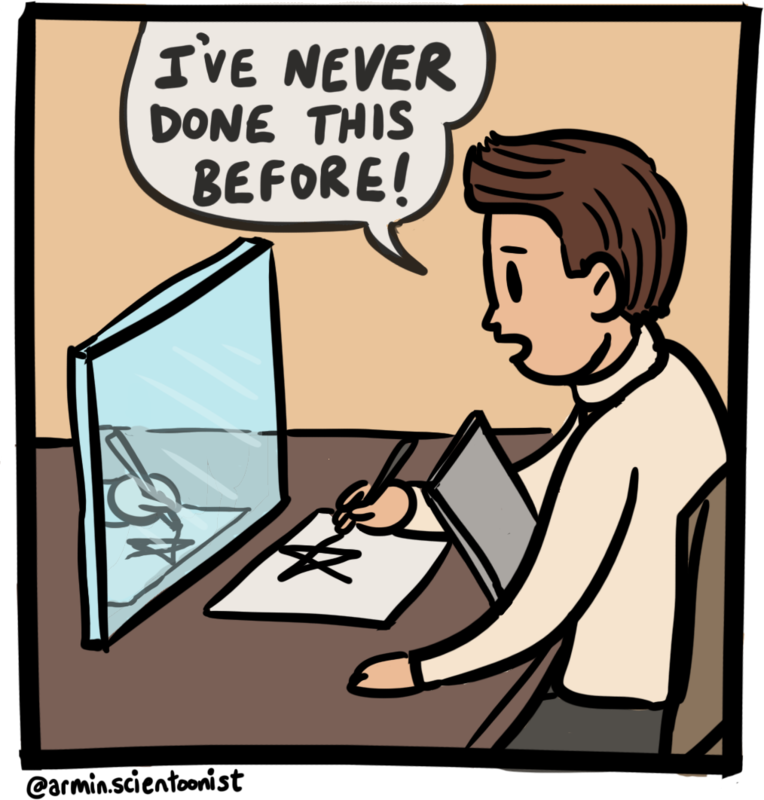 This image shows the mirror-drawing task in which participants must trace the outline of a star through only the reflection of their hand and the image. Patient H.M. exhibited retention of this task over time, despite not remembering learning it. Milner also thoroughly tested a number of other neurosurgical patients. Her decades of research helped define many functional areas of the brain, establish that the human brain consists of multiple memory systems, and that the left and right hemispheres have continuous interactions. Milner had an enormous impact on the field of cognition, emotion, learning, and memory – and she is still sharing her immense knowledge and experience through teaching and researching. Brenda Milner celebrated her 100th birthday in July 2018. 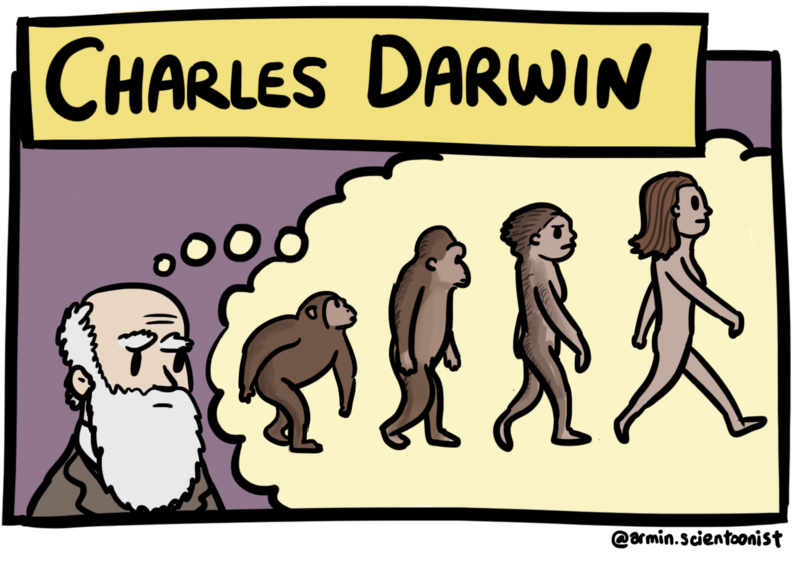 Click for a cartoon on Charles Darwin!!! 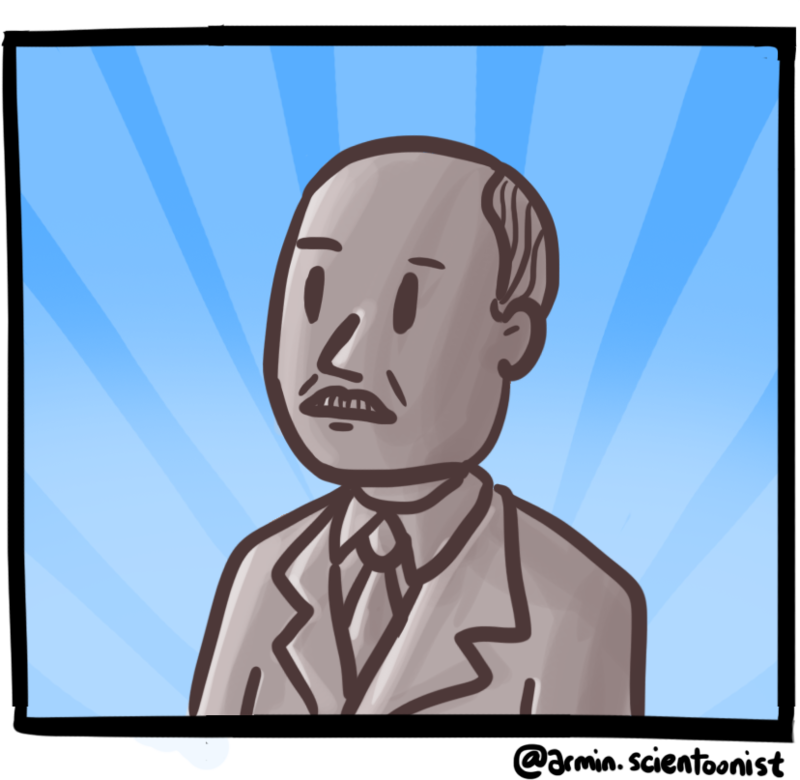 Click for a cartoon on Theodor Schwann!!! 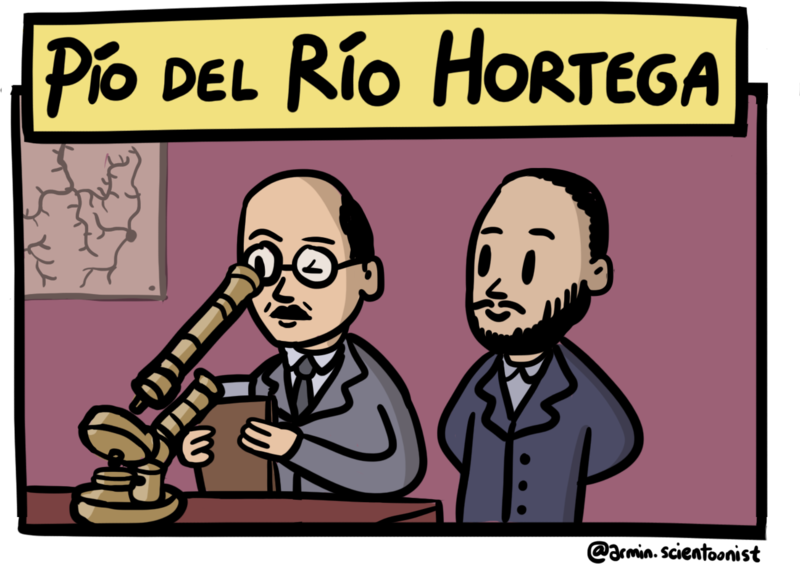 Click for a cartoon on Santiago Ramon y Cajal!!! 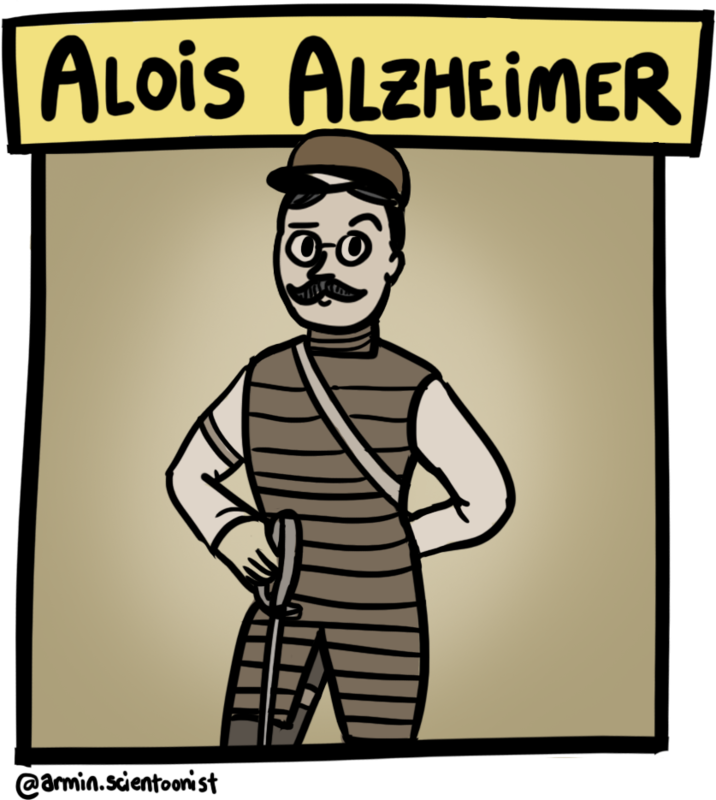 Click for a cartoon on Alois Alzheimer!!! 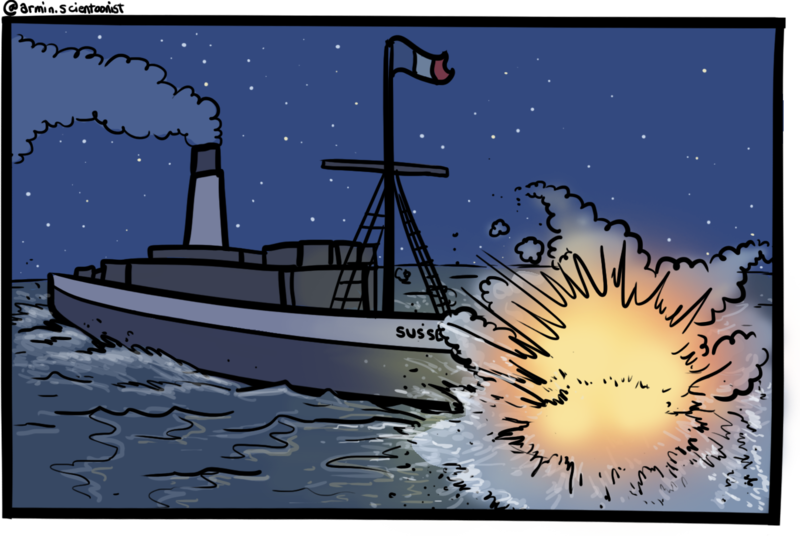 Click for a cartoon on Pio del Rio Hortega!!! 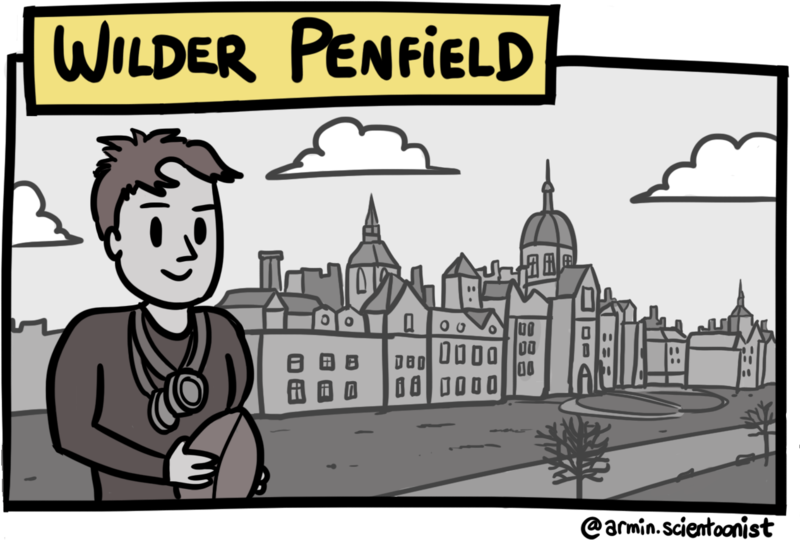 Click for a cartoon on Wilder Penfield!!! Click for a cartoon on Donald O. Hebb!!! 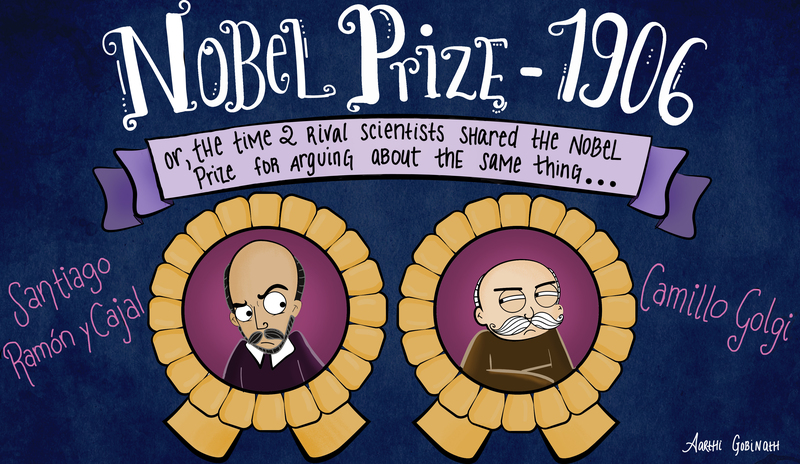 Click for a cartoon on the Nobel Prize of 1906!!! 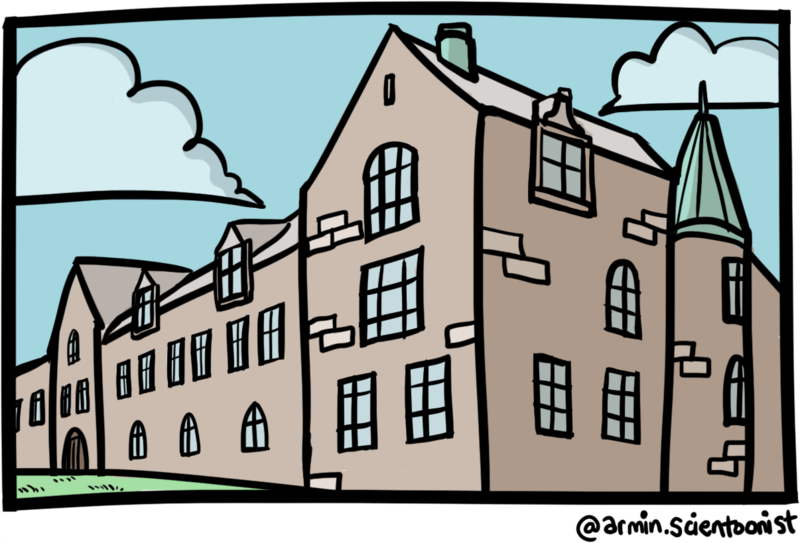 Click for a cartoon on Roger Sperry!!! 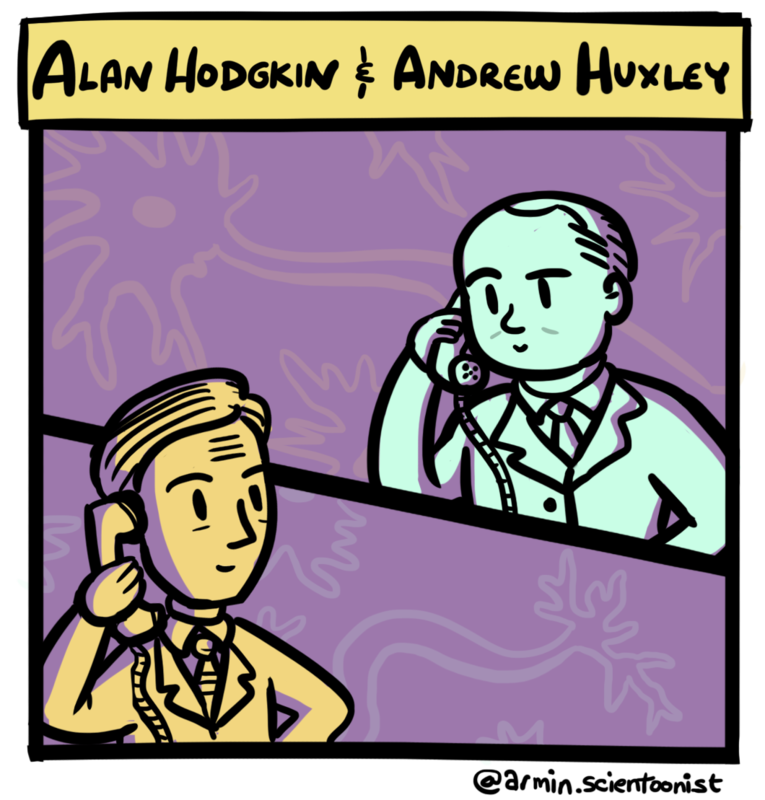 Click for a cartoon on Alan Hodgkin & Andrew Huxley!!! 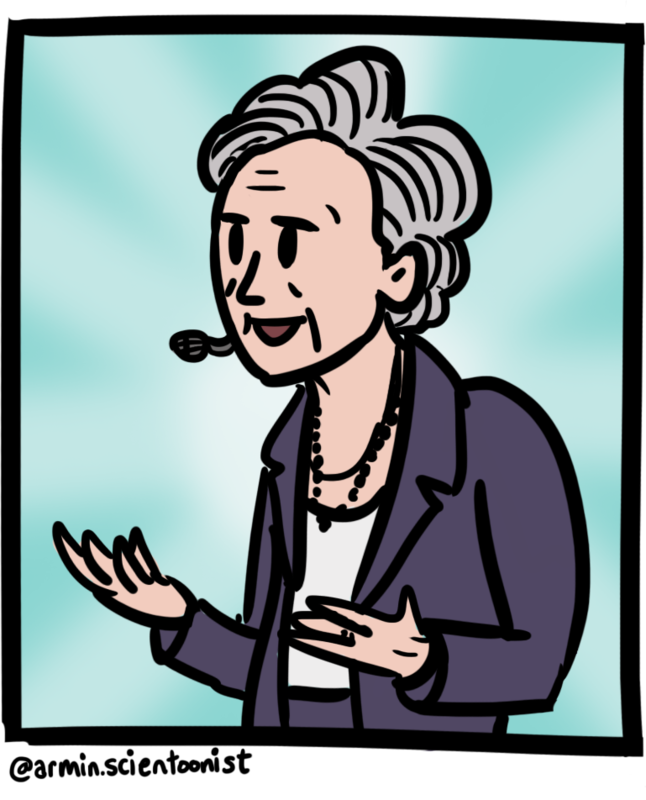 Click for a cartoon on Brenda Milner!! !